For 95 straight months now, I have been fortunate to find topics, at least some of the time, that bring together a little industry history as well as look to the future – ideally with a congruence of topics that I have covered previously. Sometimes I throw in a touch of irony or surprise too. Add a good basic marketing or business principle or two, and I’m in blogger heaven. When it all lines up, the research and the writing just flow, and my biggest issue will be keeping my word count down to a reasonable level that won’t chase away readers. 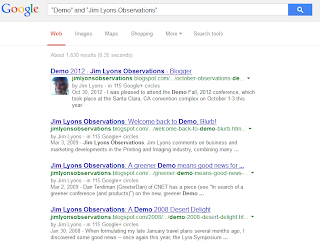 This month’s connections start at the DEMO Fall conference held earlier this month in Santa Clara, Calif. One of my favorite haunts to find new products and solutions, I have attended DEMO conferences for nearly 20 years – often once, sometimes twice a year. The first 10 years or so were from the vendor side, but since 2006, I have attended as a member of the press in an effort to share these connections with my readers. 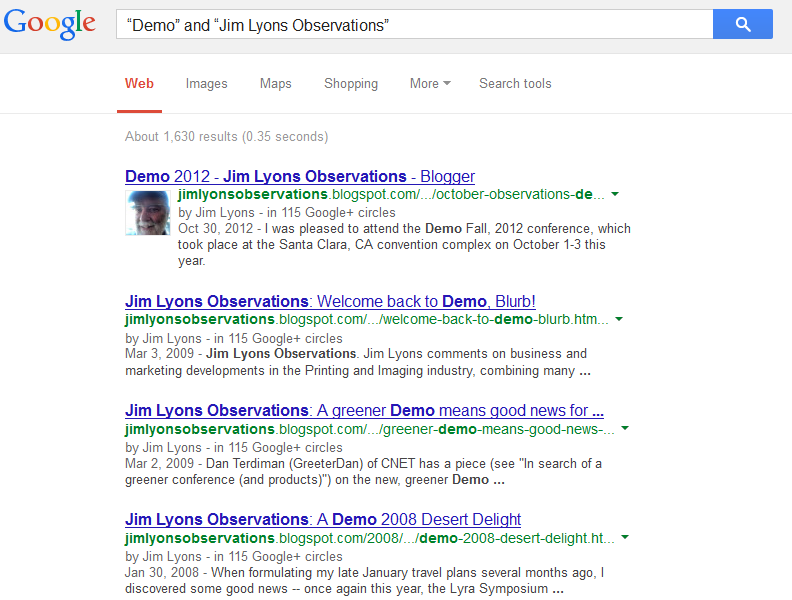 Google “DEMO” and “Jim Lyons Observations,” and you will find many of these summaries from DEMOs past. One of the emerging features among enterprise-oriented print solutions over the last few years has been that of pull printing. 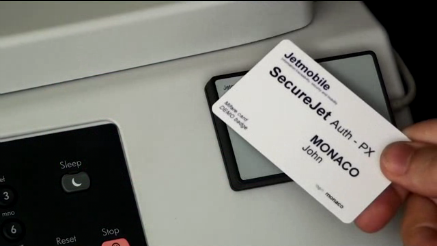 Touted as a labor-saving, resource-conserving, security-focused feature, “pull printing” describes the capability for users to print to a shared device anywhere in a building or a campus, then retrieve the print job by entering a PIN or, even slicker, with the wave of a user’s security card at the selected printer. The use case fits nicely with evolving office environments, including more shared printer/MFP/copiers, and stresses management control, security and mobility. One of the companies demonstrating this year at DEMO struck a familiar chord for me, though not through the normal channels. 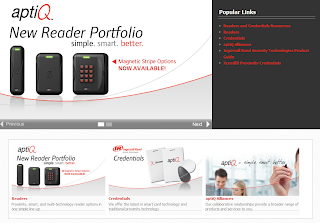 Ingersoll Rand, a North Carolina-based industrial firm, was a customer of my employer’s in a long-ago previous life, and one of its business sectors, Ingersoll Rand Security Technologies, was on the agenda with its aptiQmobile (pronounced “ap-teek” mobile) solution, nestled among other companies in DEMO’s “Payment and Entry” section. Its solution is described as turning “your smartphone into a mobile credential” that can then be used to open doors and other applications in lieu of a badge ID card. Using near field communication (NFC) technology, it allows selected smartphones (many Androids, though the iPhone requires an NFC-enabled sleeve) to take the place of custom-made security cards. Their demo (at DEMO) only ran for the standard four minutes, covering many typical solutions such as acting as a card key for doors. But a conversation with company officials later revealed that, indeed, enabling pull printing via smartphone and aptiQmobile’s technology is a potential use application. Diane Kehlenbeck, director of technology alliances, explained the company’s long-standing business in these areas – such as being a leader in the receiving side of the security credential system – has allowed the company to creatively use the smartphone as a security credential. 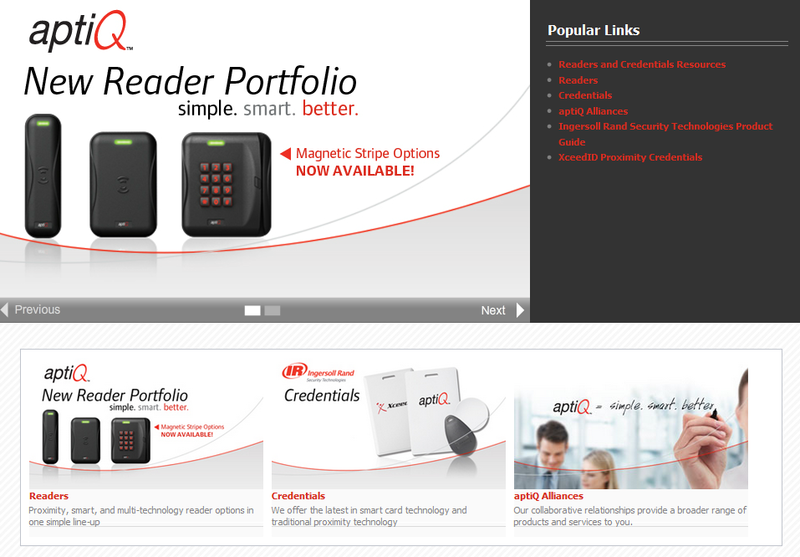 In this $1-billion business, mobile credentials are used more and more all the time, and one of aptiQmobile’s demo videos highlights its advantages in terms of cost and turnaround times in a university setting. In addition to “pull printing,” as we see in enterprises, smart cards or their equivalent are often used for enabling (and accounting for) student printing. From my industry perspective, until recently I was most aware of NFC positioned as a potential “replacement” for QR codes, which have been one of the “shining stars” of the hard-copy business over the past few years. 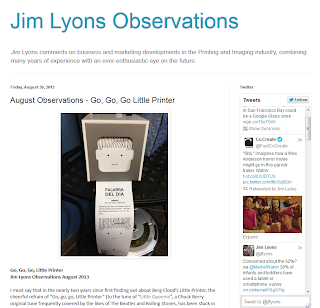 (See “January 2010 Observations -- From the QR Code Sandbox — and Will QR Codes Help Printing?”). But, of course, NFC capability has recently become built in to printers, where users can “touch and print” with their mobile devices. It’s an interesting development, essentially adding a new i/o. (Remember when the first Wi-Fi or even USB printers seemed amazing?) 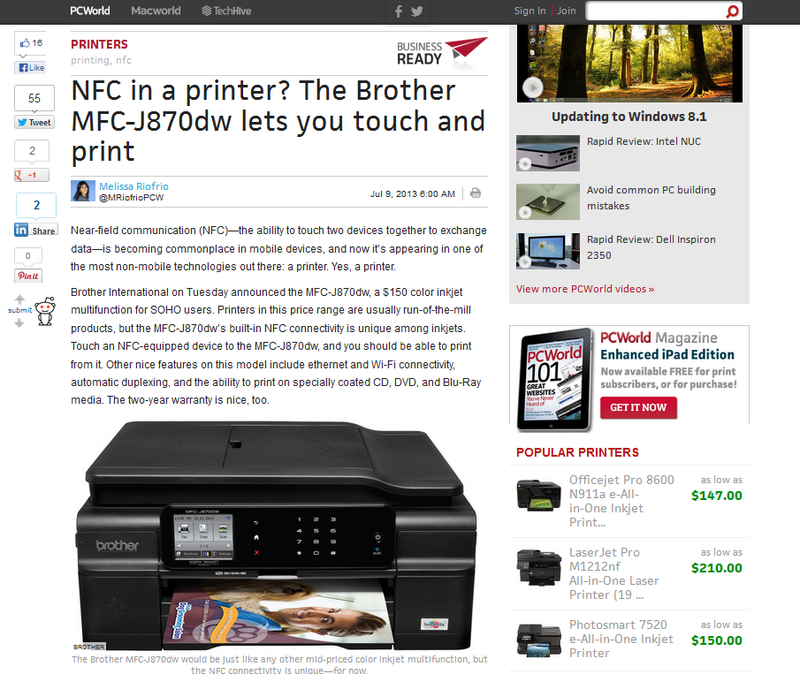 We would expect a common new communications interface to be added to printers, just like other devices. But aptiQmobile does one better, I maintain, by taking advantage of the pervasiveness of smartphones and adding them to an expanding ecosystem that already includes pull printing. Marketing principle: The first application of new technology mimics the old … but just wait! With smartphones and mobile devices, generally, most of us in the business have immediately locked on to the train of thought that “printing from mobile” is a direct analogy to printing from PCs, which has driven the industry for so many years. 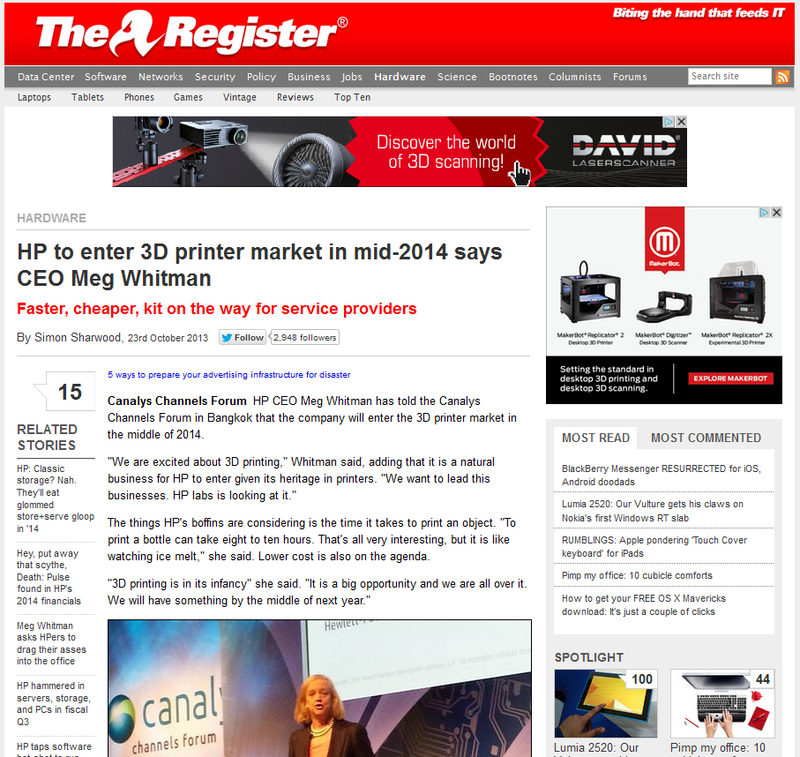 If smartphones are replacing desktops, how (and how much) will they print? There has been a great deal of speculation on the topic. One recent industry report on printing from mobile devices is titled “Mobile Devices: Friend or Foe of the Printing Industry.” I also wrote a recent piece on the Mopria Alliance and will be leading a seminar titled “How, Why and When (and When Not) to Print From a Mobile Environment" at the upcoming Business Imaging Expo on Dec. 10-12 in Las Vegas. What we see with aptiQmobile, as stated above, is a relatively new ecosystem in which pull printing has a role (if a somewhat limited one so far). And smartphones, based on both their capabilities and pervasiveness, are available, via creative and competent vendors like Ingersoll Rand, to change the printing landscape in an indirect but potentially very important way. With smartphones, we have a world that has changed completely and forever, and printing habits and patterns will not simply migrate from how we have done it in the past to how we will do it now and in the future. But without painting the game as a simple “win-loss” template, printing and imaging has a chance to prosper in some still unimaginable ways. Little Printer creators moving ahead! The Little Printer, as regular readers may recognize, has been one of my favorite topics over the last several years (for the latest, see "Go, Go, Go Little Printer"). 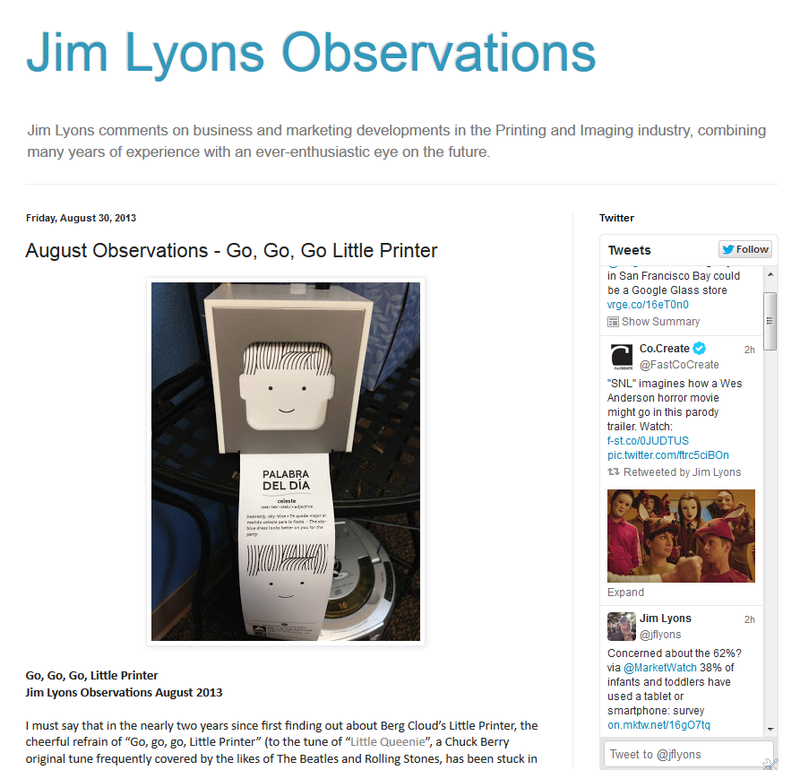 Its creative inspiration and success have fit very nicely with "Jim Lyons Observations" and one of my overall themes, that printing is only as old and tired as we wish to make it, and there are signs of life, if not wherever one looks, at least in selective locations. This morning BERG Cloud, the company behind Little Printer, had an email waiting for me in my inbox,the contents of which are also available on the web. (See "BERG Raises $1.3m Funding Round and Announces Public Launchof BERG Cloud"). 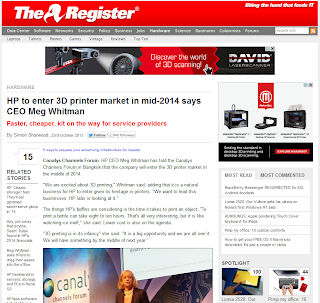 And I love their press release's sub-head: "We’re taking funding to make the technology, services and design thinking behind Little Printer available to everyone." For those who know a bit about the business and the company, this is really, really interesting, in a number of ways! Today is the day that the Microsoft Surface 2 ships, and the new Apple iPad(s?) are announced. When voting with their dollars, end users seem to be opting heavily for the first option, in the form of iPads, Kindle Fires, Nexus 7's, and the like. And me? Actually I own a variety of them, but found myself depending heavily on a Samsung Chromebook while traveling last week - go figure! 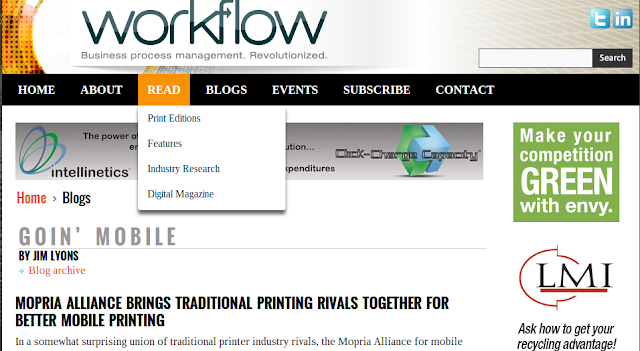 Mopria mobile printing alliance - very interesting! I will point my readers here over to my "Goin' Mobile" blog and my post on the Mopria mobile printing alliance.